The word “Convention” means ‘The act of coming together’ or ‘the state of being together’ or Union. Vice Chairman:Mr. Mir Zahid Hussain. 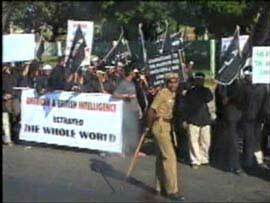 The Shia Muslims of Tamilnadu were also in the forefront in organizing rallies and taking out protest processions condemning the defamatory cartoons of the Holy Prophet of Islam (p.b.u.h) published in much of Europe’s media, Danish in particular and the destruction and desecration of the Holy Shrine of the 10th and 11th Shia Imams at Samarra, Iraq. Momineen of Tamilnadu state of South India did not lag behind other Muslim brethren of different parts of India as well as the world in condemning the defamatory caricatures of Holy Prophet of Islam (p.b.u.h ) and also the desecration of the the shrine of 10th and 11th Holy Imams in Samarra. 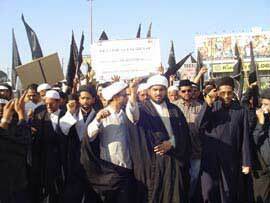 Under the leadership of our Chief Shia Kazi, Moulana Ghulam Mohammed Mehdi Khan Saheb, a protest rally was held on 27th February 2006 at the Thousand Lights Mosque campus – which is the main Shia Muslim centre at Chennai, South India. 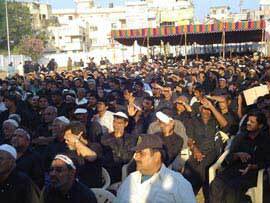 Hundreds of Shia men and women from Chennai city gathered to mourn the destruction of the Holy Shrine of their Holy Imams. Prominent personalities both from Shia and Sunni communities addressed the gathering and it had the desired effect in that it created a solemn atmosphere of mourning in the real sense of the term. Subsequent to the above rally all the Shia Muslims of Tamilnadu organized two programmes – a protest procession and a public meeting on 7th march 2006. No efforts were spared to make these two programmes a grand success. Alhamdulillah, our mammoth procession comprising of about four thousand Shia men and women drawn from all over Tamilnadu was so orderly and peaceful that it, not only earned the appreciation of the law enforcing authorities but also the onlookers and the media as well. This procession comprised of large numbers of banners and placards containing messages condemning the West for the defamatory cartoons as well as the barbaric acts of indignation and brutality against the poor helpless Iraqis and also its attempts in making matters worse by creating internal strife in Iraq. After the termination of the massive procession, a protest meeting was held in the campus of the historic Wallajahi Mosque (popularly known as the Big Mosque) through the good offices of Nawab Mohammed Abdul Ali Azim Jah Saheb, the Prince of Arcot. None other than Mr. N. Ram, Editor-in-Chief of the internationally popular Indian daily THE HINDU, Chennai, delivered keynote address of this meeting. Besides Mr. N. Ram the other speakers were the Prince of Arcot Nawab Mohammed Abdul Ali Azim Jah, Chief Sunni Kazi of the State Government Mufti Salahuddin Mohammed Ayub Saheb and theChief Shia Kazi Moulana G.M. Mehdi Khan Saheb. 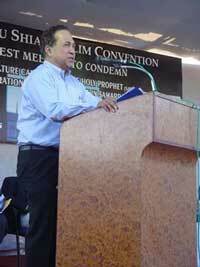 The chairman of Tamilnadu Shia Muslim Convention, Mr. N.A. Mirza welcomed the gathering. The vice-chairman Mr. Mir Zahid Hussain read out the resolution adopted at the meeting and the secretary Mr. Kumail Hyder Khan proposed the vote of thanks. To highlight the protest procession and a public meeting, a blood donation camp in coordination with the Lions Club of Egmore, Chennai, was organized on 5th March 2006 in the Chota Nakhsha Mubarak premises in Royapettah which is the heart of Shia Chennai. A large number of Shia men and women donated their blood in the name of Imam Hussain (a.s). Alhamdulillah, all our programmes received a wide coverage in the print media. Subsequently on 14th March, led by the Prince of Arcot Nawab Mohammed Abdul Ali, and eight member delegation of the Shia Muslim Convention called on His Excellency Surjit Singh Bernala, the Governor of Tamil Nadu, at the Raj Bhavan, Chennai and presented the resolution adopted at the protest meeting. The Governor was all praise for the peaceful manner in which the procession was taken out and the protest meeting conducted. Tamil Nadu Shia Muslim Convention, presented a resolution to the Governor, which criticised the publication of the caricatures of Prophet Muhammad in a Danish newspaper, and the demolition of the holy shrine at Samarra in Iraq. The delegation requested the Governor to forward the resolution to the Governments of Iraq and Denmark and to use his good offices with the Union Government to lodge its protest with the Iraqi Government for not adequately protecting the shrine at Samarra. During the meeting, Mr. Barnala stressed the need for Shia-Sunni unity in the country. He also highlighted the importance of education, particularly girls' education, says a release. CHENNAI: They wore black ribbons, they carried placards calling for peace, they put up banners saluting the Mumbai martyrs, they announced a signature campaign, and they prayed. Chennai's 10,000-strong Shia Muslim community turned out in full force at Thousand Lights mosque on Tuesday morning for two reasons the Eid-ul-Adha prayer and the special meeting to protest the "barbaric deeds" that took place in Mumbai for three days beginning November 26. After the customary prayer that began at 10.30 am and ended at 11.15 am, Ghulam Mohammed Mehdi Khan, the Chief Shia Khazi, and NM Mirza, chairman of the Tamil Nadu Shia Muslim Convention and member of the wakf board, addressed the gathering of more than 200 people under a banner that read: "Islam condemns the barbaric deed of the self-declared jihadis. We salute our security officers who perished to save our country. Our sympathies are with those innocent souls who died in the tragedy in Mumbai." Khazi Mehdi Khan said in English, "What is the logic and rationale behind three days of relentless firing and bombing in Mumbai; three days of disaster? I request each and every Indian regardless of their caste, community, state, religion or race to stand united against such baseless and inhuman groups because our sustenance and survival lies in our unity as Indians and not as individuals. No religion promotes terrorism and terrorism has no religion." "Islam is a religion of peace," said Mirza, "and a Muslim is a patriot above all else." He went on to tell the gathering that the Taj Mahal hotel in Mumbai was a symbol of patriotism. "Do you know that when Jamshedji Tata tried to enter a hotel in Mumbai in the late 1800s, he was turned away because he was an Indian? He built the Taj Mahal for Indians. Is that not patriotism?" said Mirza. Trader Navaz Currimbhoy described it as a landmark day. "This is the first time I have heard a Khazi categorically condemn an act of terror. It's also the first time that the speech was made in English so people could understand it. 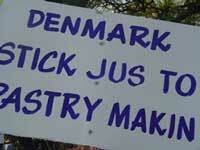 Usually, general sweeping statements are made. But this time, the act was outright condemned and I am glad I was there to hear it," he said. Navaz, in the last week, has written a letter which he is handing out to Muslims in the city and elsewhere addressed to the Prime Minister's office, which states that the signatories of the letter are Indians born in Muslim households and who do not believe that it is right to support, harbour, encourage, glorify or attribute any positive feeling to any Muslim that indulges in terror or violence on any account. "The letter also states that our allegiance lies to our government," says Navaz, who adds that he wrote out the letter as he was upset about people coming to India to avenge the Muslims here. "Indian Muslims do not need to be avenged. Two wrongs do not make a right," he says. He is also asking people to visit the website of the Prime Minister's office and write in offering support to the government. Special prayers for Eid-ul-Adha were also held at Island Grounds, Big Mosque in Triplicane and across the city. The Mumbai attacks, still fresh in people's minds, cast a shadow on the celebrations. Mohammed Usman, a private taxi driver in Triplicane, said, "This year it just doesn't feel like Eid. The neighbourhood is quiet due to the terror attacks in Mumbai. We have toned down our celebrations and just observed the basic rituals." CHENNAI: In his relatively new role as president of the Ajmer Dargah management committee, the Prince of Arcot Nawab Mohammed Abdul Ali intends to prioritise security, connectivity and better management of resources at Ajmer’s famed symbol of communal harmony. Some of the proposals the Nawab is mulling include setting up a university on one of the several lands belonging to the Dargah and persuading the Centre to set up an airport in Ajmer. “I have already written to the Civil Aviation Ministry highlighting the need for an airport at Ajmer,” Nawab Abdul Ali told journalists after a felicitation organised in his honour by the Tamil Nadu Shia Muslim Convention. The Nawab is the first person from South India to be appointed president of the Ajmer Dargah management committee, a statutory body of the Government of India. “It is an honour and at the same time a great responsibility,” the Nawab said of his Ajmer assignment. Since assuming office as president in September, 2007, the security has been stepped up at the Ajmer Dargah, the tomb of the Sufi saint Hazrath Khawaja Moinuddin Hasan Chisti, he said. Governor Surjit Singh Barnala, who was the chief guest, called for upholding religious tolerance and communal harmony and leaving no room for disruptive forces. “Understanding other faiths helps deepening of one’s own faith,” Mr. Barnala said. N. Ram, Editor-in-Chief, The Hindu, said the Nawab upheld the core values in personal and public life that were a hallmark of the Arcot Nawabs’ legacy of upholding secularism and pluralism in society. Though a non-political personality, the Nawab was not one to shirk from confronting a threat to communal harmony as he had shown during the communal riots in Chennai a few years ago, Mr. Ram said. Replying to the felicitations, the Nawab appealed to all religious sects to eschew fanaticism, which only served to weaken the nation, especially in times when Islam was being targeted as a religion of terrorism. Mufti Khazi Salahuddin Mohammed Ayub, chief Khazi Sunni, and Moulana Gulam Mohammed Mehdi Khan, chief Khazi Shia, Government of Tamil Nadu, felicitated Mr. Ali. Najaf Ali Mirza, Syed Imtiaz Ali Sahib and Asgar Ali Dhala Sahib spoke.